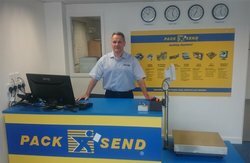 Established in 1993 in Australia, PACK & SEND is fast becoming the leading specialists in packing and shipping in the UK. We pride ourselves on being able to satisfy the unique, and sometimes complicated, needs of our customers. Our franchisees run a one-stop-shop management franchise offering a collection, packing and delivery service to anywhere in the world for both businesses and individuals. With well over 20 years of growth since our launch in Australia, higher UK sales than ever before and virtually no direct competitors, we are proud of our unique business proposition. We are accredited by the British Franchise Association (bfa) and we have previously been Australian Franchisor of the Year. We currently have 5 franchisees in the Greater London area. The success of these franchisees, and the sheer enormity of the London market, highlights the opportunity that exists for other likeminded individuals to join the PACK & SEND network. Our franchisees come from a broad range of backgrounds though the one thing they all share is a passion for helping people and creating long-term business relationships.